The Honorable Governor of the Indian state of Madhya Pradesh, Shrimati Anandiben Patel called on His Holiness Dr Syedna Mufaddal SaifuddinTUS, the 53rd al-dai al-mutlaq and head of the worldwide Dawoodi Bohra community, in the city of Ujjain today. Syedna is in town to pay respects at the revered graves of community leaders who have been laid to rest in a beautiful, century-old mausoleum in this historic city. 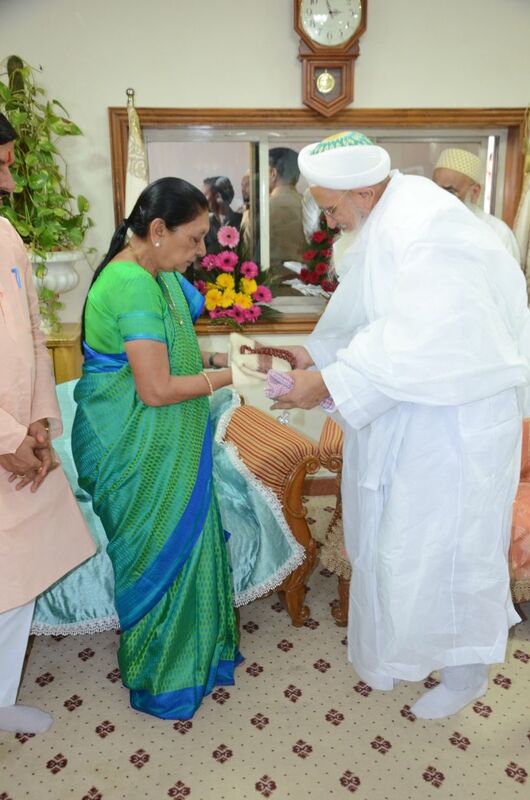 Shrimati Anandiben Patel, who especially flew to the city by helicopter to meet with His Holiness, enjoys a relationship with the Dawoodi Bohra community spannning decades. The governor had previously met with Syedna Saifuddin in Ahmedabad in 2015 when she was the Chief Minister of the State of Gujarat. She has also met with the late Dr Syedna Mohammed BurhanuddinRA, His Holiness’ respected father on numerous occasions and visited the community’s historic academy in Surat, Aljamea-tus-Saifiyah, as Cabinet Minister of Education for the State of Gujarat in 2004. During their meeting, His Holiness expressed his gratitude to the Governor for her continuous support of the various social initiatives undertaken by the Dawoodi Bohra community. The Governor, in turn, sought Syedna’s and the community’s continued assistance in her various programs for the state’s development. Local members of the Dawoodi Bohra community also spoke very highly of the Governor’s efforts for the state and its inhabitants. The Prime Minister Shri Narendra Modi’s work for the state and the entire nation was also discussed and praised. MLA Dr Mohan Yadav and other senior officials accompanied the Governor and thanked Syedna for his visit to the city. Syedna once again thanked Shrimati Anandiben, city officials, the police and all its inhabitants for their hospitality. An exchange of traditional shawls and gifts took place following which the Governor visited the sacred mausoleum before leaving. Previous articleInternational Women’s Day – Life in Heels and the Parachute Rida!